Highland Park Fish Camp's all cedar rustic cabins are very popular with fishermen and families. 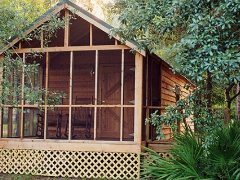 Our air conditioned cabins are 12' x 32' and are fully furnished including linens. The full size kitchens have dishes and utensils with full size appliences. They offer T.V. with satellite dish and Wi-Fi is available at the office. Enjoy sitting out on the screened in porches as you kick back on our Cracker Barrel rocking chairs. Plan your trip today! Our cabins are pet friendly for non-aggressive breed animals. One time pet fee $15 per stay. Our fully furnished one bedroom cabin is spacious enough to sleep 4 adults. With hardwood floors and rustic charm, these hideaways offer a living room, bedroom, full bathroom, screened in front porch, charcoal grill and modern kitchen complete full size appliences. This cabin offers one bedroom with two full size beds and a full size sleeper sofa. One Bedroom Cabin $105 a night. Please see our rates for more information. Our fully furnished delux one bedroom cabin is spacious enough to sleep 6 adults. With hardwood floors and rustic charm, these hideaways offer a living room, bedroom, full bathroom, screened in front porch, charcoal grill and modern kitchen complete full size appliences. This cabin offers one bedroom with two full size beds, twin bunk beds and a full size sleeper sofa. One Bedroom Delux $135 a night. Please see our rates for more information. Highland Park Fish Camp's new two bedroom cabin is spacious enough to sleep 4 adults. With hardwood floors and rustic charm, these hideaways offer two bedrooms, a full bathroom, large screened in porch and a modern kitchen complete with full size appliences These cabins offers two bedrooms both with a full size bed and a twin bed in each bedroom. Our two bedroom cabins do not offer a living room, but are perfect if you are looking for a little more privacy. Two Bedroom Cabin $135 a night. Please see our rates for more information. Non aggressive breed pets are allowed for a $15 fee per stay.